It takes a lot of water to get your food from fields to fork — and your diet makes up the largest part of your water footprint. The term “water footprint” is used to indicate the amount of fresh water that any given process or activity uses. Growing and processing crops and livestock consumes large quantities of water; therefore, the water footprint for food is high. Animal products, especially, like meat, dairy and eggs (all of which tend to require more water than fruits, vegetables and beans) have an even higher water footprint. Individually speaking, one’s diet makes up the largest part of one’s personal water footprint; and this is why preventing food waste individually matters: because discarded food not only wastes the water that went into producing it, but all other resources involved, as well. Blue Water Footprint: The amount of surface water and groundwater required (evaporated or used directly) to produce an item. For food, this refers mainly to crop irrigation. Green Water Footprint: The amount of rainwater required (evaporated or used directly) to make an item. For food, this refers to dry farming where crops receive only rainwater. Grey Water Footprint: The amount of fresh water required to dilute pollutants and make water pure enough to meet EPA water quality standards. For food, the water would have become polluted from agricultural runoff or leaching from the soil. In the United States, agriculture is responsible for 80 percent of all water consumed (through evaporation or other means that remove it from a watershed). 2 It takes a surprising amount of water to grow and process food, because crops cannot grow without water, especially not without irrigation water. In fact, one’s diet accounts for more than two thirds of one’s own total water footprint, mostly because of all the “virtual water” needed to produce one’s food. Virtual water is the “hidden” component in a production process, which contributes to the total water footprint. A typical lunch-time meal reveals how quickly virtual water adds up, according to data from the Water Footprint Network. 3 One loaf of bread takes about 240 gallons of water to produce, while one pound of cheese takes about 382 gallons. A simple cheese sandwich adds up to about 56 gallons of water. 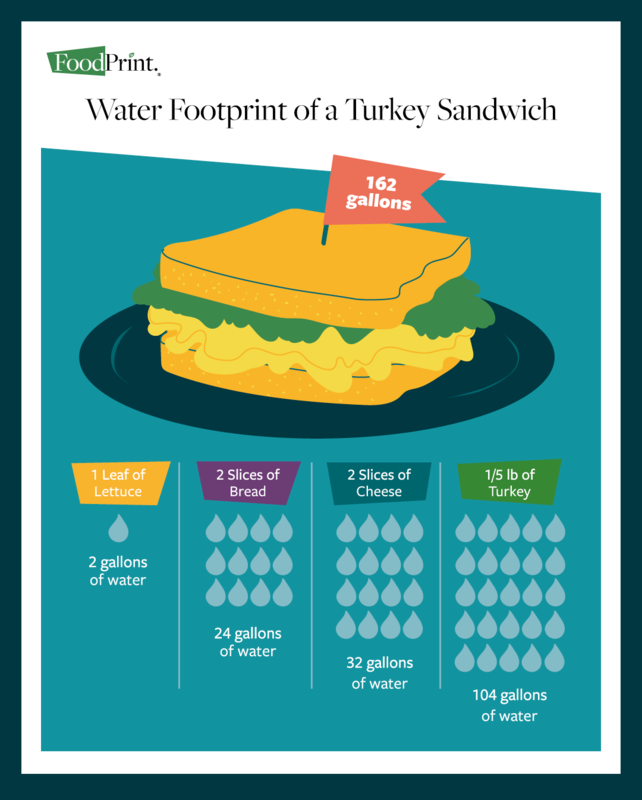 Add some sliced turkey, and the water footprint jumps to 148 gallons. Throw in a small bag of potato chips at 12 gallons and you’re up to 160. Include an ice-cold soda at 46, and this typical lunch took 206 gallons of water to produce. Pound for pound, meat has a much higher water footprint than vegetables, grains or beans. 4 A single pound of beef takes, on average, 1,800 gallons of water to produce. Ninety-eight percent goes to watering the grass, forage and feed that cattle consume over their lifetime. 5 Where cattle diet consists mainly of grain-based feed, such as in industrial livestock production, the blue water footprint is high; where their diet consists mainly of grass and forage, the green water footprint is high. Pasture-raised cattle, by comparison, spend their entire life eating grass. They typically take 24 to 28 months to reach market weight, because it takes longer for them to gain weight. 12 Because they rely on grass that is predominantly rain-fed, grass-fed cattle have a higher green water footprint, which isn’t a problem unless there is a drought that impacts availability of grass. In addition, manure from grass-fed cattle production is typically used as land fertilizer and is part of regenerative agricultural practices in well-managed pasture operations. Where food is grown can also impact a person’s water footprint. California, for example, produces more food than any other US state, supplying a large part of the country’s milk, beef, produce and nuts. 1920 It is also one of the nation’s driest states and recently experienced a drought of historic proportions. As a result, California’s agricultural sector puts enormous strain on the water supplies of the entire southwest, mainly through its allotments from the Colorado River, which it shares with other states. A significant portion of that limited water supply is then “shipped” as virtual water when they export almonds or alfalfa (for animal feed) to other states or countries, like Japan and China. 2122 Likewise, when food is shipped from other states and countries, it taps into distant water supplies. As global trade increases the amount of food that is moved around the planet, these calculations become important indicators of the actual amount of water used to get these foods to peoples’ plates. In short, agriculture has a significant impact on water resources; and while people’s individual water footprints will never approach zero, the more meat, dairy and processed foods each of us consumes, the more water we use and the higher our water footprints. That is why it is important to understand how the various components of water footprints for a particular food item are calculated. Use the Water Footprint Calculator to find out how your diet affects your personal water footprint. Find ways to stop wasting food and remember that discarded food wastes all the resources it took to produce that food, including water. Choose pasture-raised animal products when you can. Use our Labels Guide to help choose the best animal products for you and your family. Reduce the amount of processed food in your diet.